article published in the liberal & Allgemeine Zeitung of Judaism Bad Kissinger acting Rabbi, Moses Leib Bamberger (son of Rabbi Seligman Baer Bamberger, since 1865 acting Rabbi in Bad Kissingen, subsequently appointed as permanent Rabbi in 1872) announced that he had requested from the Unsleben municipality to install a traditional grid to the women&#39;s gallery of the synagogue, which led to a violent reaction. In March 1931 the synagogue was desecrated with swastikas. 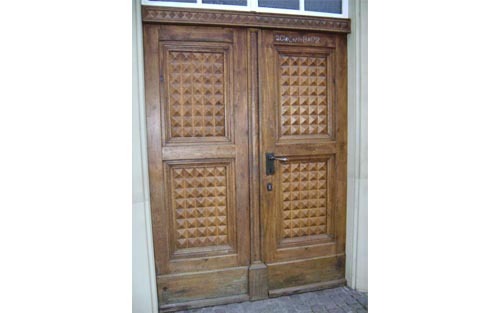 Following the anti-Semitic riots on 30 September 1938 in Mellrichstadt, the Torah scrolls and other ritual objects were removed from the synagogue in Unsleben and hidden in a safe place. After 1945, they were brought to the United States. 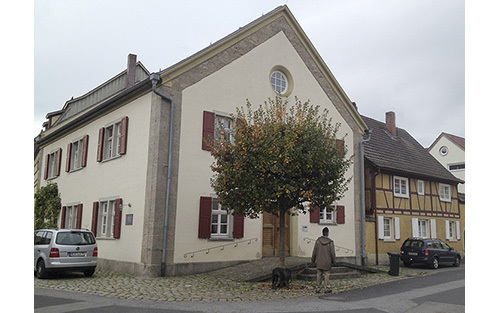 In the Pogrom on November 1938, the ritual objects of the Bastheim community, which had been brought to the Unsleben synagogue in September 1938, were destroyed. After the last Jewish inhabitants were deported, the local government took over the Jewish community assets and used the synagogue for the fire department. Around 1950 the community bought the synygogue and built in facilities for the housewifes work. In the eighties of the 20.th century it was converted into in a convention room and tthe adjacent former Naumann-grainery into a meeting hall.;. A memorial plaque is affixed on the building.